Microsoft is clearly interested in shifting more Surface hardware, which is good news for existing fans of its products. For those who have been sitting on the fence, the Redmond giant has just launched the new Surface All Access plan in the United States. All Access is essentially a monthly subscription service that combines Microsoft’s Surface hardware with its Office 365 software. 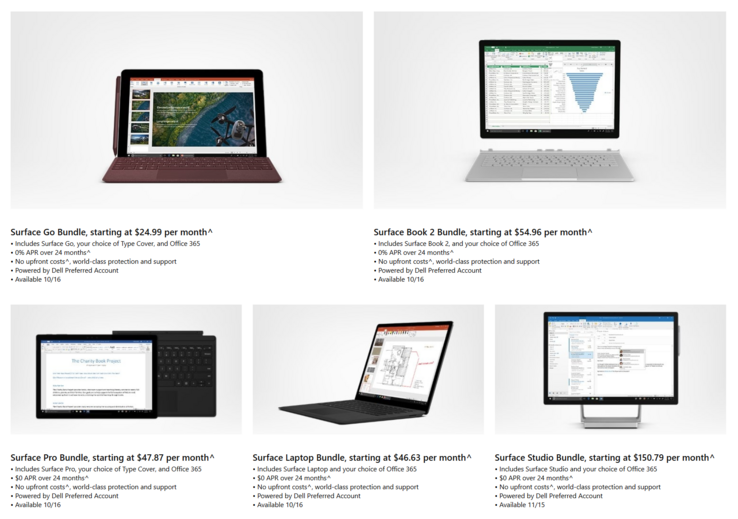 If, for example, you’ve had your eye on the new Surface Go, you can purchase one including a Type Cover and Office 365 from just US$25 per month. The offer is interest-free and requires payments over a 24-month period. While there is no saving in purchasing the bundle, it does save customers from having to fork over the US$600 up front. Say the Surface Pro bundle is more your cup of tea, you can one with a Type Cover and Office 365 from US$47.48 per month. Like the new Surface Laptop? Combined with Office 365, you can get on board from US$46.63 per month. A Surface Book 2 with Office 365 can be picked up from US$54.96 per month while the Surface Studio can be yours from US$150.79 per month. The Surface Go, Surface Pro, Surface Laptop and Surface Book All Access offers will be available through the Dell Preferred program starting from October 16. The Surface Studio All Access offer will be available from November 15.